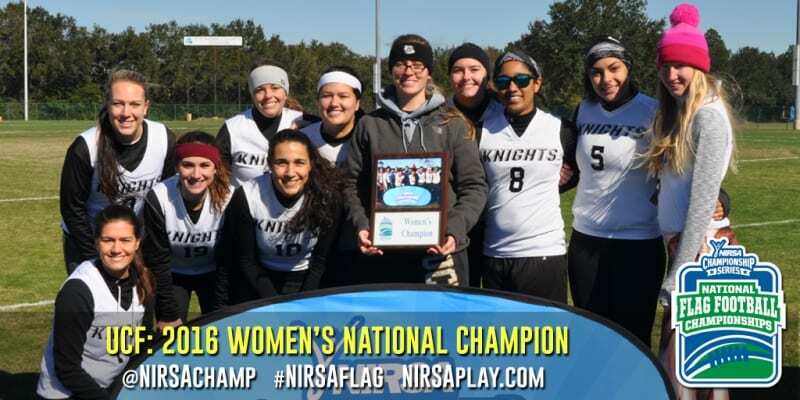 The UCF Check on It dynasty wrote yet another chapter in 2016, holding off an inspired North Carolina A&T team 13-2 in the final for its fourth consecutive women’s national championship. UCF’s invincibility was tested during pool play when an upstart Texas State squad took the team to overtime. UCF would prevail 12-6 in pool play then swifty took care of business against Texas State in a quarterfinal rematch 18-0. It’s semifinal match-up was yet another challenge as Check on It used two late scores to push past Southern 20-7. In the championship, UCF faced an North Carolina A&T squad that had demonstrated a strong offense and a solid defense throughout the weekend with a 37-0 pool play win, 13-6 defeat of 2015 finalist FAMU, and a dominant 38-7 performance against Angelo State in the semifinals. But, the Check on It defense, led by MVP Tati DeAraujo, would be the story once again. A&T offense could not find its groove in the championship. UCF capitalized on field position and late in the 1st half was able to tally a pair of touchdowns, one on a Megan O’Hara to Kaitlin O’Hara 28-yard pass and another on a Carli Homish to Tati DeAraujo 16-yard strike. UCF held the A&T offense off the scoreboard in the 2nd half, with the Aggies picking up 2 points on a safety on a Domynique Shelby sack in the 3rd quarter. DeAraujo and Megan O’Hara were named to the All-Tournament team for UCF, joined by quarterback La’Quana Hordge and back Tiffany Ellick for A&T and 3 other players.